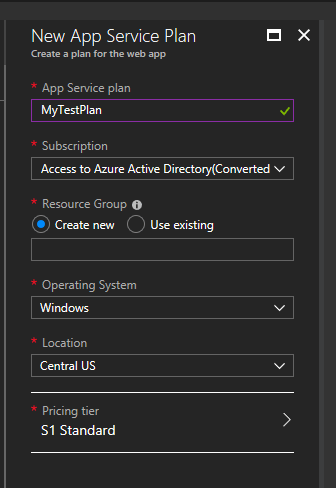 Hello and welcome to another article on Azure App Services. 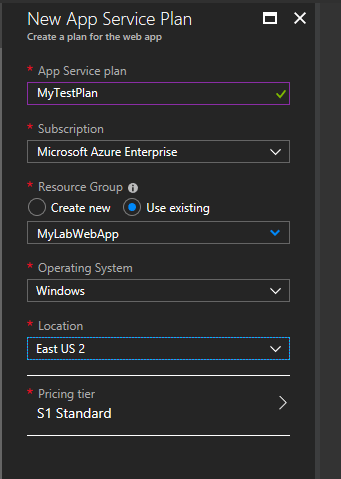 Previously, we wrote an introduction to Azure App Service and we followed up with an article on how to deploy a web app using Azure App Services. Today we will talk about App Service Plans. An App Service Plan consists of the underlying virtual machines that will host the Azure App Services. It has several tiers, from Free to Premium. The App Service Plan defines the region of the physical server where your app will be hosted on and the amount of storage, RAM, and CPU the physical servers will have. The more resources the higher the tier and higher the price. 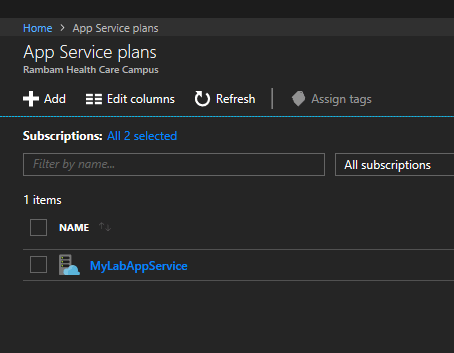 Now let us dive in and create a new service plan that will host all our Azure apps. First, login to the Azure Portal, go to the management dashboard and then go to App Service plans. Then, click on the Add button to start the New APp Service Plan creation sequence. The App Service plan name can be any name you would like and it is a good practice to make it as specific to the types of applications you will be hosting there or to the tier you are going to build it in. For now, I’ve named mine MyTestPlan since this is not going to host any real world applications. Next, I chose an existing resource group or you can choose to create a new one. It is not recommended to create a resource group for each Azure service. Instead, you should create one or two resources groups and put all your resources in there. You can choose between Linux and Windows under Operating System. I chose Windows for the purpose of this article. The Location option defines the physical location where the plan will be hosting your application. In our case, it’s East US 2. Finally, we have the Pricing Tier. The tier controls the amount of resources you can assign to your plan and will determine how well your app behaves in a production environment. As you can see, we have several different tiers: Free, Shared, Basic, Standard and Premium. Let us talk a bit about each one. The free tier is obviously free, the shared tier has a very low cost, and they are both hosted on shared infrastructures with other clients. This means they are very inexpensive, but not recommended for production workloads. The Basic, Standard and Premium are the next-up tiers after the shared ones that give you isolated environments, which also means the prices will go up since you will have several VMs at your disposal and not run on a shared VM with other clients. Each of them offers you different options in terms of RAM and CPU, but that’s something you would need to size up before creating a service plan. I hope this article has been of some value to you and I hope you enjoyed reading it!